Internship vs. Student Teaching…Which is Better? Spring is in the air and many education majors are planning their student teaching. I remember my student teaching experience as though it were yesterday. Luckily, I knew exactly what age group I wanted to teach: middle school…and I remember my advisor thought I should reconsider, thinking that early elementary would be a better fit for me. So, I split my time between Waterville Junior High and Winslow Elementary. Both schools were welcoming to me, but I was MUCH more comfortable with 7th and 8th graders than I was with 4th. I’m glad I got the experience of working with my cooperating teacher at the fourth grade level, because she is a wonderful person, but teaching-wise, I would have been more prepared for the working world if I had been able to stay in one place. Now, many universities offer two different ways of completing student teaching. One is the kind most of us completed where there are two placements, each for about eight weeks. The second is called an internship. This allows a college student to observe one teacher at least one day per week for the fall semester and complete their student teaching with that same teacher during the spring semester. 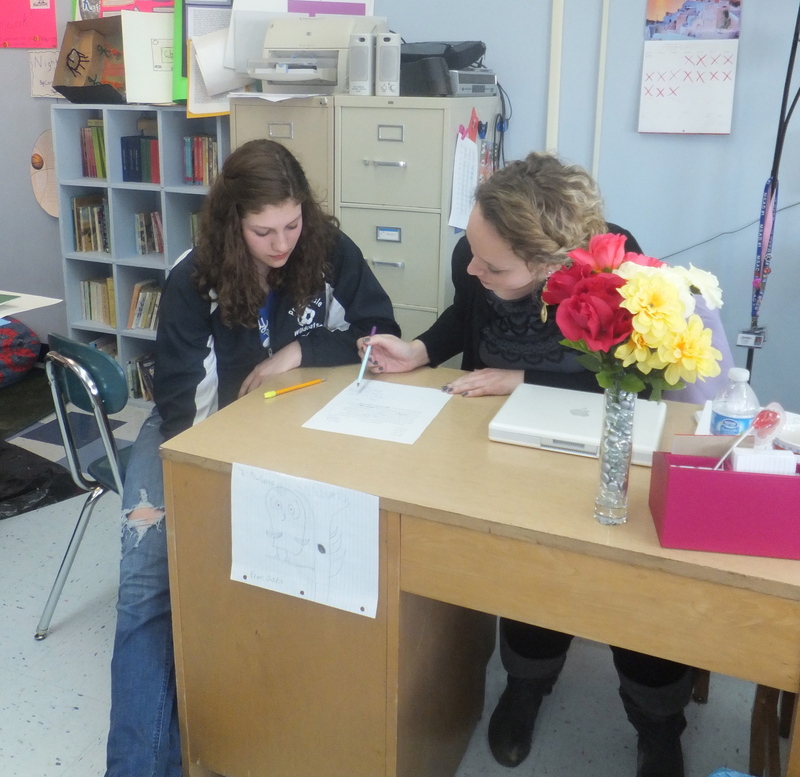 In my humble opinion, one of the most important professional steps teachers can take is to advise a student teacher. So, this year I opted to participate in advising an intern. Since there is an interview process through the university and with prospective teachers, I had more say in whether or not this was someone with whom I thought I could work. In the past teachers in my school have been asked about accepting student teachers, but we haven’t always known them before they appear “on our doorstep”. For me, the new process seemed to be in everyone’s best interest. The only downside I’ve been able to come up with is saying good-bye at the end of the spring semester. I’m sure there are probably others, but if people are honest during the interview process, I believe it really works out well. I can’t really say which is a better scenario for everyone, but I think it’s worthy of consideration. I know for me, being the cooperating teacher of an intern is a better option for me. Maybe it would be for you too! This entry was posted on March 19, 2012 at 2:31 pm and is filed under Food for Thought, Great Teachers, Leadership, Professional Development, Uncategorized. You can follow any responses to this entry through the RSS 2.0 feed. You can leave a response, or trackback from your own site. Great post Julie! I think an internship is probably a better reflection of what teaching full time would be like. Also, anything that enhances the connection between and among the prospective teacher, mentor, students, and school community would be a plus. I say this as someone who began with a one semester student teaching assignment but due to a medical emergency with my cooperating teacher, was given the opportunity to step into the role of a classroom teacher (with supervision from my university instructors and school based mentors). It was exhausting, exhilarating, and ultimately a great learning experience for me, and I hope, for my students! Thanks Chris! I’m sure your students got a lot out of it too! And I agree that it is a better mirror of what true teaching is. Good question, Julie. My vote is for a longer, more involved internship as you described, but I also like the opportunity for prospective teachers to work with a couple of different teachers. However, two eight-week experiences don’t cut it either. Too short for any kind of meaningful relationships to develop. Are we suggesting more than a one-year experience in the classroom? Start earlier in their four years of college? I’ve always liked the MAT (Master of Arts in Teaching) format, but the kicker is that it is fifth year program. I believe the more often we get prospective teachers in the classroom, the more likely they will find their niche. Not everyone is intended to be a 1st grade teacher, or middle school teacher, or high school teacher, just because they know they want to teach children. I’ve known from the beginning that middle school was where I belonged, and though I was with a wonderful teacher in a 4th grade placement, it was not where I was comfortable teaching. The trend of people becoming teachers and not staying in the profession for a long time is not a surprise to most people, but I think there are ways to change that. More exposure in classrooms would definitely help!